• tsukineko versacraft ink refill bottle for versacraft ink pads. 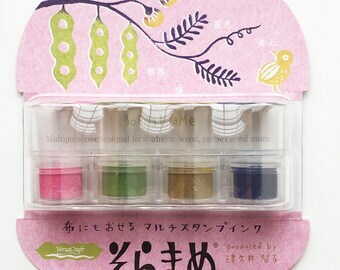 • multipurpose water based pigment ink. • choose 1 color from option drop down bar! • refill inks are always good to have when you have many stamping projects. • we only stock 1 bottle per color. if you would like to order more than 1pc per color or colors we don't carry, please contact us for a special order. • color may look different from screens to screens. • you can stamp on: paper, fabric, wood, pebble, unglazed ceramic, terra cotta, tanned leather. • ink must be heat set on textiles with an iron. • it is recommended that the “cotton” or “high” temperature setting be used for at least 15 seconds. • lower temperature settings may result in decreased permanence. • after heat setting, items can be washed and images will remain / varies by fabric type. • use hair dryer to heat set versa craft on wood and terra cotta. • ink may wash out of fabrics prior to heat setting / some staining may occur. • when ironing, place a cloth between your project and the iron. • drying time varies based on surface/material, humidity, etc. • when heat setting with an iron, place a cloth between your project and the iron. • stamped textiles with versa craft will be water resistance and washing resistance after heat setting. • the level of water and washing resistance will vary on materials. 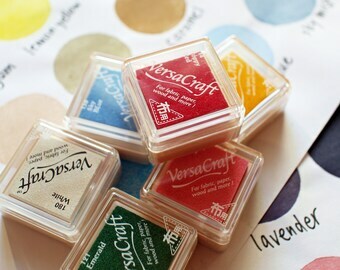 • versacraft is non toxic, acid free, water based, archival pigment ink. Package was delayed because of the typhoons, but arrived quickly once it left the country! Seller is very polite, and I'm very happy with my purchase! Received the ink well! Thank you!